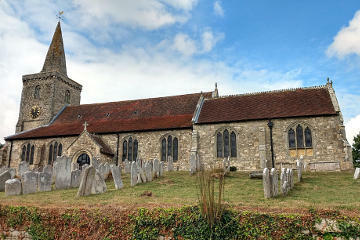 The position of Brading Church on the limestone eminence at the head of Brading Haven lends probability to the tradition that it was the site chosen by St Wilfred when he sailed from his monastery of Selsey on the opposite mainland, to convert the Jutes of the Isle of Wight. It is not improbable that Wilfred consecrated the site as a Christian Church. Such a building would probably have been of wood, and it may have ceased to exist by 1087 when the Domesday Book omits to make mention of a Church of Brading, though such an omission is not necessarily proof that there was no church. The manor of Whitfield, in a part of the parish more remote from the sea, possessed a chapel endowed with great tithes and this may have sufficed for the scanty population until the growth of Brading, advantageously situated for commerce on the harbour, necessitated a larger central church in the 12th century. The harbour, which invited Wilfred to land, perhaps enabled bands of marauders to descend on the Island and destroy Wilfred's earlier church and cause the chapel at Whitfield in a safer position to be used for a time as the parish church. In any case, no part of the existing church at Brading is earlier than the middle of the 12th Century. It now consists of a nave with aisles, a tower at the West end and a chancel flanked by north and south chapels. The pillars of the nave which have five bays, appear to be Transitional Norman and support pointed arches. This part of the Church was probably built by William FitzAzor about 1160. William, with the consent of his wife, Mabel, granted the advowson to the Priory of St Helen's, which was a cell of Wenlock in Shropshire; but in 1241 Walter Lisle, a great-nephew of William the founder, whom his granddaughter had married, claimed the advowson in the right of his wife. The Prior of Wenlock disputed Walter's claim, but urged that he was unable to answer, because the advowson belonged to the Prior of St Helen's. Three years later the suit was decided in favour of the Prior, who in 1253 sold it to Aylmer de Valence, Bishop designate of Winchester. On the bishop's death the advowson came to his next of kin, King Henry III and continued in the Crown until Edward I granted it to the prior of Braemore as a set-off against 500 marks he owed for stock etc. on the manor he had obtained from Isabella de Fortibus. The Prior of St Helen’s again claimed the advowson but in 1347 finally gave it to Braemore which held the patronage until the dissolution of the monastery when the Crown granted it to Henry Courtney, the Marquess of Exeter, on whose execution for treason in 1539 it again reverted to the sovereign, and was given in 1546 to Trinity College, Cambridge. The church erected in the 12th century seems to be hardly commensurate with the needs of a large parish of about 9000 acres comprising Whitefield Manor, with its own Chapel of St Nicholas, Wolverton chapel, dedicated to St Urian, and those at Alverstone and Yaverland, together with the later chapel of St John, Shanklin as well as the domestic ones of Middleton and la Wode. So we find that aisles were added in the 13th. Century of which one lancet window still remains in the west end of the north aisle. The tower is of the same period, standing on four piers with open arches and surmounted with a broach spire. The chancel is also of this period but the triple lancet window at the east end is more modern, having been substituted for a debased one when Sir Albert Bloomfield rebuilt and slightly lengthened the chancel at the expense of Trinity College, Cambridge. On the north side of the chancel is a chapel built by the parish and the de Aula family about A. D. 1500. The decorated pillars between this chapel and the chancel appear to be of earlier date than the arches they support, providing some evidence for the existence of an earlier building on the site that had been destroyed by fire. The South chapel, which Sir John Oglander, writing in the 17th Century, states had been built by his family for their own use and those of their tenants, has long been appropriated as a burial place for the Oglanders. It was restored, leaving its 16th Century details, by Sir Henry Oglander in 1866. Over the pulpit in the nave there is a niche with the date 1513 in a curious mixture of Roman and Arabic numerals. It may have been intended for an image of the Blessed Virgin Mary, to whom the Church is dedicated. The tower contains eight bells, the oldest dated 1594. There is an early Jacobean altar table now placed at the East end of the Oglander chapel, and in the South aisle there are two chests, one a good panelled parish chest of the time of Elizabeth I. The reredos is a fine work by Powell of Whitefriars with representations of the Disciples at Emmaus in cosmati tesserae under a perpendicular canopy. It was erected in 1900 by Lord Rollo. Of the ancient monuments, the finest is an incised slab of marble in the sacrarium to the memory of John Cherowin, Constable of Portchester Castle, 1441. The engraved figure represents him in plate armour standing beneath an architectural canopy, on the sides of which are six small figures in niches and at the angles symbols of the evangelists. The helmet, hands and sword hilt appear to have been filled-in with mastic or metal which has been taken away leaving these spaces blank. In the de Aula chapel there is a table tomb to William Howlys and Elizabeth his wife, dated 1500. Of the numerous monuments to the Oglanders in the chapel, the earliest is the table tomb on the south side in memory of John Oglander, who died in 1482, the inscriptions on the shields of which have been defaced. The next in date is that between the chapel and the chancel with figures of Oliver Oglander and his wife Anne and his children. He died in 1530. On the north side of this tomb is a representation of what may be a chrysom child, that is one who died aged under one month. Oliver's son, George, is commemorated by a brass on the south wall dated 1566. The table tombs next to the East wall of the chapel have full length recumbent wooden figures in plate armour. That on the south wall is a well executed figure of Sir William Oglander who died in 1607 and that on the north a rude figure on the tomb of Sir John Oglander, the diarist, who died in 1655 which he states was already in the chancel and he desired that it should be placed on his tomb. A small replica of the same figure in an arched recess in the wall commemorates John's oldest son, George Oglander. A large table tomb under the South wall is the work of Powell and is to the memory of Sir H. Oglander and Louise his wife; she died in 1894. On the floor are several marble ledger stones inscribed for members of the same family. In the nave are similar ledger stones for the Knight family of Langard, the oldest being that of Thomas Knight and Francis his wife dated 1669 and showing a coat-of-arms of Knight quartering Page of Donington, Sussex. Another ledger stone is here to John Fitchett of Grove, dated 1730. On the south wall is a brass with an inscription recording that Legh Richmond was Curate-in-charge of the parish from 1798 to 1805. Jane Squibb, who died aged 14 years in 1799, was immortalised by the account he gave of her exemplary life in the Young Cottager and by his verses on her headstone in the churchyard. Jane, “the YOUNG COTTAGER” lies buried here. At the West end is a list of the Rectors of Brading beginning with John de Marisco, 1247 and all the Vicars since 1301 when the ancient demesne of Henry de Oglander belonging to the Abbey of Lire in France was appropriated to the Priory of Wenlock. Also to be noted are the fine Dutch candelabra in the chancel dated 1798, the Royal arms of William and Mary over the door of the north chapel, and the piscina and holy water stoop in the sacrarium. There is no documentary evidence for the construction of Yaverland church. Indeed, it was not until 1305 that the church is first encountered in the written record when a chantry for the Russell family (then lords of the manor of Yaverland) is mentioned in the returns of the Dean of Winchester. But the church is clearly Norman, and the elaborate carvings around its archways suggest a late Norman foundation of the 12th century, from the 1140s or thereabouts. It is thus one of several thousand stone churches built or re-built by Norman lords within a hundred years of the Conquest, a scale of construction matched only by that of the Victorians. The church was founded most likely by the de Aula lords of Yaverland, although it is not certain that the de Aulas were seized of the manor at that time. They are first mentioned as such in a deed of 1228. The de Aulas, of Norman descent, were a prominent family in the Island during the Middle Ages and held at times other estates in addition to Yaverland. On a small site within yards of Yaverland Manor, the church is a fine example of a Norman proprietary (private) chapel built by the lord of the manor for the exclusive use of his family, tenants and retainers. It was not uncommon for Norman lords, or indeed Saxon before them, to build such chapels alongside or even within their manor-houses. Several examples of this juxtaposition survive elsewhere but Yaverland is the only instance extant in the Isle of Wight, and a better instance it would be hard to find. At some time during the Middle Ages the church became parochial, that is to say, serving an ecclesiastical parish and subject therefore to the jurisdiction of the bishop of the diocese, in this case Winchester. This had most likely occurred by 1305 when the Russell chantry, as noted above, was mentioned in the Dean's return. Such mention implies a diocesan interest by that time in the affairs of Yaverland church. 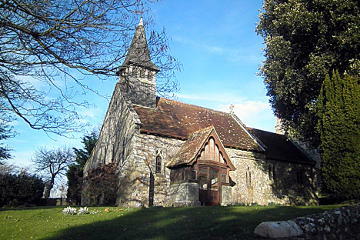 Historically, the medieval church of Brading was, and to some extent remains, the burial church for Yaverland parish. Yaverland itself does not have a grave-yard. Brading was for long accepted, if only by custom, as the 'mother church' of Yaverland. As late as the 17th century, Sir John Oglander in his memoirs makes reference to the ancient practice whereby the priest and congregation of Yaverland would progress to Brading at Christmas and at Easter, and provide annually straw and candles and a pension of 10 shillings in acknowledgement of that status. Yaverland was assigned as a 'garrison church' during the reign of Henry VIII, initially for the troops at Sandown Castle built by Henry in the 1540s, and so continued until 1945. The east Wight until recent times was home to a series of military installations on account of its strategic position beside the English Channel and Portsmouth Harbour. The church has not had a priest of its own since 1921, when a plurality was established between the parish of Yaverland and that of Brading. A combined benefice of Brading with Yaverland was subsequently created and was latterly looked after by a house-for-duty Priest. On 20 March 2018 proposals were published in a draft scheme, pursuant to the Mission and Pastoral Measure of 2011, to unify the benefices of Seaview, St Helens and Brading with Yaverland to create a new benefice to be named "The Benefice of Seaview, Saint Helens, Brading & Yaverland" with the parsonage house being that of St Helens. The draft scheme was open for representations to the Church Commissioners until 24 April 2018 and subsequently came in to operation. As laid out in the scheme, the Reverend Alison Morley will become the first incumbent of this new benefice with the parishes of Seaview, St Helens, Brading & Yaverland retaining their separate identities.